If I had to name just one underwater dive route that would alone be worth the travel to Sudan, it certainly would be Shaab Rumi! 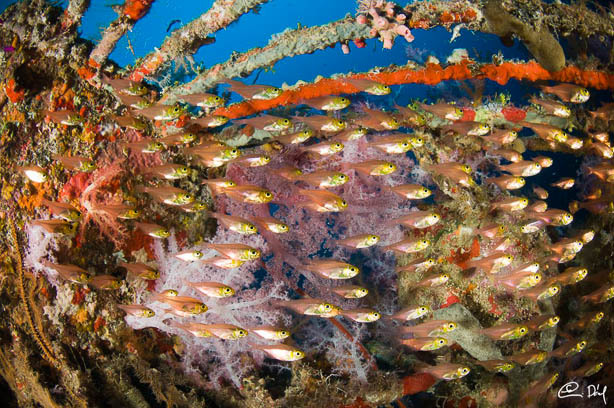 Without a doubt it is one of the most picturesque dive sites in the Red Sea. This reef lies 48km from Port Sudan and encircles a beautiful lagoon which we can cross through a man-made strait (actually blown up by Cousteau). The outer reef, surrounding Shaab Rumi’s various dive sites, contains a place that makes this area unique. Outside of the lagoon, about 100m from the entrance, Cousteau built his futuristic world, the Precontinent II, in 1963. During the experiment he researched whether a group of scuba divers could survive for several weeks underwater in a village specially designed for this purpose. Still, Rumi’s Southernmost end is its most exciting dive site. Like a balcony, a plateau stretches towards the open sea. Its three sides are surrounded by steep walls plunging into the deep. 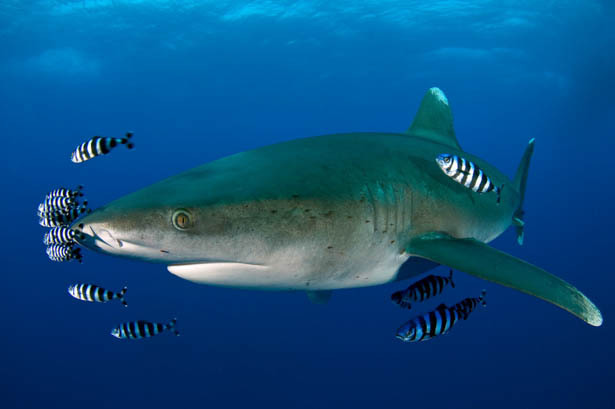 What also makes this place so unique is the always present barracuda, tuna, batfish, and reef, grey and hammerhead sharks. We formed into 6-diver groups and jumped into the zodiacs right away. After 20 minutes we were already at Shaab Rumi’s Northern point. On a count of three we backflipped into the water and began our descent. When I looked below, right away I saw the silhouette of a large grey shark! The scuba diving liveaboard operators almost guarantee shark sightings at this part of Shaab Rumi because here is the coral-encrusted Cousteau shark feeder, left behind to this day. The sharks have long gotten used to this place, waiting for their old friend, Cousteau, to return and to make their regular feedings again. Swimming above the plateau, the greys were already swarming around us. I counted about 15 around me but I never knew how many more could have been behind me. The sight was amazing! What was up close and real now, I only saw in documentaries. Though my battle plans primarily included the stalking of hammerheads, at that moment the greys had my complete attention. For 20 minutes I was just looking all around, never knowing from which direction they were coming towards me only to change direction with a quick whip of the tail less than half a metre from me. Meanwhile giant bass were irritating the big fish, bravely facing them. After a long watch, we left the greys behind us and continued for the North point of the plateau, closely swimming over the plateau. We barely made a few fin kicks when we ran into a giant barracuda school counting 80-90 of them. Some of them were as long as a metre and a half. By the time we reached the drop-off, our air supply was dwindling, so after the safety stop, we met on the surface to share our latest experiences. Between the two dives, familiar fins appeared about 200m from the live aboard, heading straight for us. Right away we knew that a group of dolphins arrived in the lagoon, right beside us. That was it and half the boat jumped into the water, people flying over the railings. I tried to make room through the crowd on the scuba diving platform. With my mask and fins in place, I jumped into the water, right among the dolphins. It could not have been directed better! The beauty of their figures and moves is something no other animal can come close to. As if they were being moved by the sea, they swam in front of us with great precision. They always fascinate me and again I swam an hour with them. What an amazing scuba diving holiday! A narrow plateau starting at 20 Metres stretches out for 50-75 m then drops off at 40 m. It drops to 600 m on all sides. The best option on this dive is to head along the edge of the plateau keeping a vague eye out in the blue, but mostly looking at the plateau itself. This is the best scuba dive place on earth and the best place for hammerheads in the Red Sea! During one dive there is a big chance to see 40-50 in front of you. 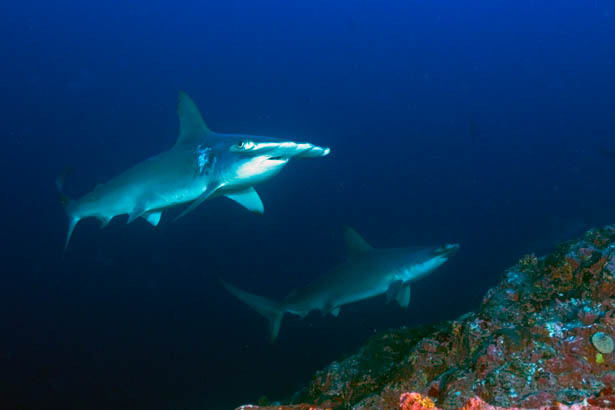 Best season for hammerheads is from November till April. on the plateau also sits Jacques Cousteau’s shark observation cage. You can lie in the sand and watch the Grey Reef Shark’s cleaning Station. If you want to be surrounded with at least 3 species of shark this is the place! Also big shoals of jacks and barracuda’s waiting for you on the plateau on every dive.